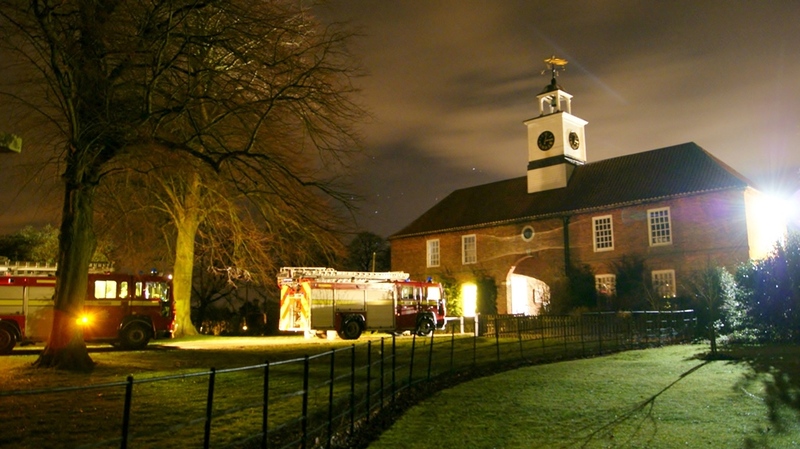 Built in 1700, Gunby Hall, a National Trust manor home, posed unique challenges to the crews due to its age, such as a narrow entrance arch, which is only just big enough to fit a fire appliance through. The exercise allowed Alford, Louth and Skegness crews to assess the logistics of attending an incident at the Grade 1 listed building, nestled at the foot of the Lincolnshire Wolds. Whilst on site, crews undertook a risk visit in the Hall in order to familiarise themselves with the premises and identify access points and water supplies. This involved touring the building and studying a salvage plan, which identified items of historical value that should be saved if possible in the event of a fire. The crews also undertook a BA exercise in the stable blocks, which were filled with artificial smoke to replicate a realistic environment for a BA search and rescue exercise. This was the second time Gunby Hall welcomed Lincolnshire crews in for an exercise – and staff say they hope it will lead to a continuing partnership. House Manager Astrid Gatenby said: “Gunby Hall is one of the few Grade 1 listed buildings in Lincolnshire, and as such we have a sophisticated alarm system that occasionally sounds false fire alarms. But even when this happens, the fire crews always turn up and take it in stride – they’ve been very good with us. Gunby Hall staff also took the opportunity to practise their own response to a fire alarm with the crews who would most likely respond to a true incident at the site. Watch Commander Support Matt King said the exercise proved very successful and praised the hospitality of Gunby Hall staff. “It was a unique training opportunity that benefitted everyone involved – and Lincolnshire Fire and Rescue rolled out more than 250 new BA sets to all its stations in April, bringing a two-year project to a successful close. Lincolnshire recently rolled out more than 250 new BA sets to all its stations in April, bringing a two-year project to a successful close. The Interspiro Spiroguide II sets were delivered in a seamless changeover and feedback has been overwhelmingly positive. Ops Support Manager Simon York, who oversaw the completion of the project, said: “The new sets have already been in use at both exercises and incidents, and the immediate feedback was that the face-masks and backplates are very comfortable to wear. LFRS has been using the Spiroguide sets for the last seven years – firstly obtaining a five year contract and then extending it for an additional two years to allow the Service to thoroughly research and analyse available replacement options. After a rigorous selection process evaluating sets on comfort, fit, ease of carrying and operation, and compatibility with existing equipment, the Spiroguide II was identified as best meeting Lincolnshire’s needs. Training, user tests and evaluations were undertaken before the sets were finally delivered on time in April. All components of the sets are new, from the log book and tally to the face mask and personal line, and the sets have the capacity for twin cylinders for use at protracted incidents. The sets feature all the latest technological and ancillary advances and are upgradeable after three years.